"The University of Virginia's Weldon Cooper Center for Public Service is a research and training organization focused on the Commonwealth of Virginia. The Center provides objective information, data, applied research, technical assistance, and practical training to state and local officials, community leaders, and members of the general public. The Cooper Center's 60-member staff includes experts in public management, demography, economics and public finance, political science, leadership and organizational development, workforce issues, and survey research." Each year, demographers at the Weldon Cooper Center develop and release the official population estimates for Virginia and its counties and independent cities to illuminate population counts between decennial censuses. These estimates provide the best approximation of the population count on July 1st of the prior year. Population estimates are an important tool used by a variety of state agencies in their planning processes — from developing budgets to determining salaries for public officials. These estimates are used in funding formulae based on per capita allocations, in planning, in budgeting, in applications for grants, in approving and setting salaries for certain public officials, and in all manner of state agencies from VDOT to VDOE. 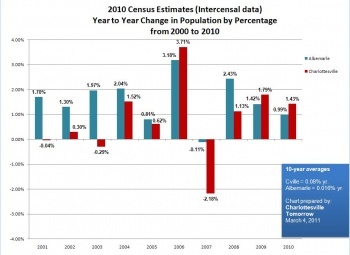 The Weldon Cooper Center's intercensal population data represents a restated view of their population projections between two official censuses. After the U.S. government produces its official estimate every 10 years, the Weldon Cooper Center goes back and revises each of its prior postcensal estimates (see postcensal data below). This table will not be updated further until after the 2020 census. 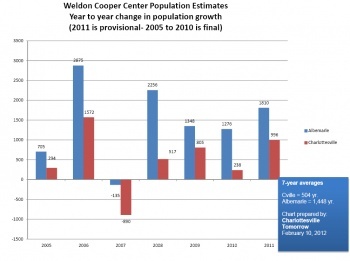 The Weldon Cooper Center's Demography and Workforce estimates population for Virginia's counties and cities each year. The estimates in a non census year are called "postcensal" because they are produced after each of the official census generated by the U.S. government every decade. These estimates are later revised to reflect actual populations changes recorded in the official census. 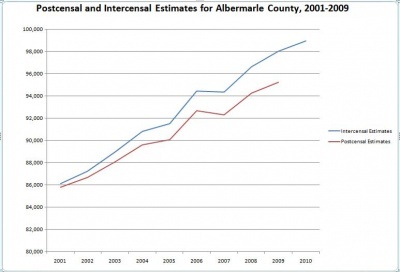 The restated population figures are called intercensal projections (see above). In February 2009, the Weldon Cooper Center published an efficiency study with the Virginia Institute of Government that had been commissioned by the city of Charlottesville. ↑ "Mission | Weldon Cooper Center for Public Service." Cooper Center Home Page | Weldon Cooper Center for Public Service. Web. 07 Feb. 2010. <http://www.coopercenter.org/mission>. ↑ Web. 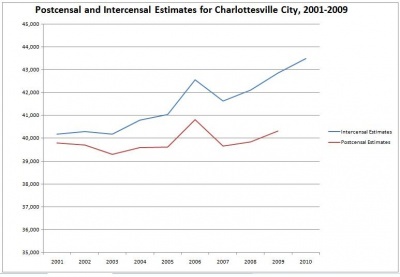 US Census Releases 2010 Data for Charlottesville and Virginia, City of Charlottesville, 3 Feb. 2011, retrieved 3 Feb. 2011. 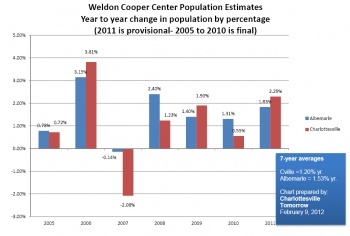 ↑ "Virginia Population Estimates | Weldon Cooper Center for Public Service." Cooper Center Home Page | Weldon Cooper Center for Public Service. Web. 07 Feb. 2010. <http://www.coopercenter.org/demographics/population-estimates>. ↑ Web. , Weldon Cooper Center, 27 Jan 2014, retrieved 28 Jan 2014. ↑ Web. , Weldon Cooper Center, 27 Jan 2014, retrieved December 21, 2015. ↑ Web. Future of City Aired at Meet, Staff Reports, Daily Progress Digitized Microfilm, Lindsay family, March 8, 1948, retrieved December 11, 2016 from University of Virginia Library. Print. March 8, 1948 page 3. This page was last edited on 9 December 2018, at 17:00.